India has witnessed significant growth in the clean technology market over the past few years. Rapid economic growth has substantially fueled demand for energy countrywide. The heightened competition for procurement of fossil fuels, prices of petroleum, and stagnant domestic production of energy have propelled India into potential energy crisis. To this end, the need for adoption of cleaner technologies presents a relatively large opportunity for both domestic and international ventures looking to offer products and services in India. Renewable energy, energy efficiency, and water and water waste management in particular are the most important drivers of clean technology in India. With this background, opportunities exist for Swiss entrepreneurs and SMEs to offer products as well as technologies in multiple areas including generation, distribution and storage of clean energy, as well as opportunities for recycling multiple forms of products. 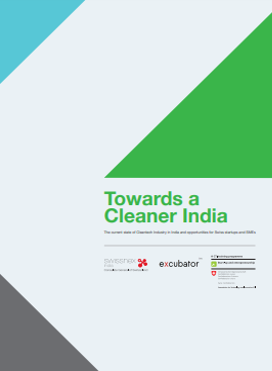 This report outlines India’s Cleantech scenario, and is intended to give the reader a succinct overview of this sector, as well as areas of opportunity and challenges.